We had guests for round 10 of frolicking: grandpa and grandma (Janelle's folks). They arrived a few days ago, are pushing through jet lag and already absorbing piles of art, Chianti countryside, tower-filled cities and multiple views of the Duomo. Friday promised snow but delivered sun---perfect for a car-delivered tour of nearby cities. Friday morning we made a quick stop at the boys' school, made another quick stop to snap some photos of the Duomo and drove on to the US Memorial (WW2). Dedicated to US soldiers, this breathtaking memorial is an eternal thank you to those Americans who gave their lives to help liberate Italy. There are stunning, inlaid maps of Italy, showcasing the battle and how Italy was finally recovered---with the concerted efforts of US and British troops. After spending some quality time at the Memorial, we drove to Certaldo. James and I had read about this little hill-topped town. We took the tram up the hill, to visit the original center of Certaldo. It was quaint, small and well-kept. 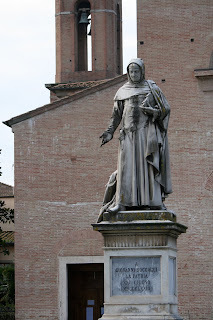 This city claims Boccaccio as its own; the one main street is named for him, we parked by his statue---and in the church are his remains. Boccaccio was a famous scholar and poet. Although most shops and museums were closed when we were there, we happened upon a ceramic shop that was full of beautiful pieces (Ceramic Artesia). Although closed, there are two delightful cafes and an impressive Palazzo---original to the Ridolfi family. This city isn't normally trounced with tourists, because visitors tend to jettison toward nearby San Gimignano. (Certaldo is so pleasant and quaint---a worthy visit if you are in the neighborhood). And being the good tourists that we are, next we went to San Gimignano. And because it is January and just after the holidays, we practically had the place to ourselves. 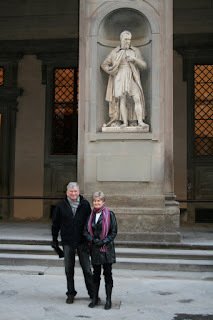 We toured the church and took in the vast frescoes (some by Ghirlandaio)---we were the only people in the whole church. We climbed stairs in the fortress to take in views of the towers, toured the many piazzas, enjoyed a sit-down panini lunch in the main square (with city-famed Vernaccia wine) and poked our heads into souvenir and wine shops. Friday afternoon, we drove on super curvy roads toward Castellina in Chianti and Greve in Chianti. It was too late to soak up the cities, so we vowed to return to Greve in a few days. We made it home---with a crate of oranges purchased from a roadside truck---ate dinner and played cards. All in all, a fabulous frolicking Friday! For more photos, visit our photo album on our familyfrolics facebook page. Another lovey and very informative post - thank you! May I assume that your parents are enjoying their holiday with you. You must be the perfect tour guides and hosts! They are very lucky, too. Thanks again for sharing this wonderful adventure with the rest of us! Love it! Barb: thanks! Your comments and feedback are so, so appreciated!